Bentley introduced the Mulsanne for the first time in 2010, to replace the Arnage. Needless to say that with time they commendably presented prototypes that took the limelight. For the year 2017, they are back again with three different variants, Speed, Standard Mulsanne and Bentley Mulsanne EWB 2017. As the respective names speak, the first comes with more power and performance while second is a standard model and the last and our model here, the EWB refers to a model with Extended WheelBase. 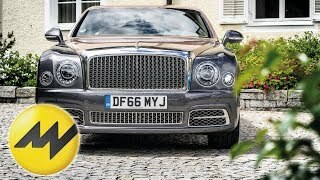 Let us have a look at the review of Bentley Mulsanne EWB 2017 to know in detail about it. The interior of Bentley Mulsanne EWB 2017 at first glance might look identical to its other two siblings; however a closer inspection will bring out some notable changes that come through its extended wheelbase. Company gave the treat to its rear passengers by adding 9.8 inches more to the model’s wheelbase. The airline style legrests giving the perfect comfort and the bespoke console separating the two seats at the rear features high-end veneer, metal, glass and leather. The latter comes with pen holders, stowage area and USB Ports. Also available as an option you’ll get deployable, folding table, electric curtains and a tilting and sliding sunroof over the rear cabin. Apart from these the remaining interior details of Bentley Mulsanne EWB 2017 remain same as the other two variants. 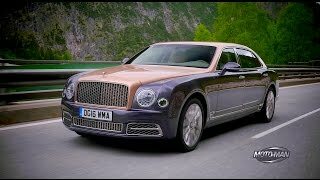 The exterior of Bentley Mulsanne EWB 2017 is more or less a carry forward of the bold design pattern that the company is following since around half-a-decade, however you can notice a new wider grille with some vertical stainless steel slats complementing the matrix mesh. Along the sides of the grille are LED headlights with advanced adaptive technology that adjust the beam as per the driving conditions. Looking at the sides the newly integrated B-shaped wing vent, which is mounted in the lower section of the fender leaves an impeccable sign of boldness and royalty while the chrome work over the window further add to the essence. Talking about the rear fascia we have a set of new taillights and a redesigned bumper. 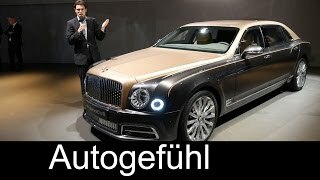 Thus rounding up the exterior details of Bentley Mulsanne EWB 2017 I would call it bolder and luxurious. Powering the Bentley Mulsanne EWB 2017 is a 6.75 liter V8 engine generating total output of 505 hp and peak torque of 1020 nm paired to eight-speed ZF automatic transmission. 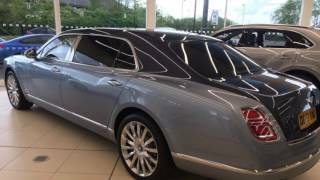 With this it can sprint from 0-62 mph in 5.1 seconds while the top speed of Bentley Mulsanne EWB 2017 touches the mark of 184 mph.